In contrast to to many other home multigym’s, the Autark 2200 offers adjustment on the backrest and seat so that it can be tailored to your body shape. The butterfly arms are five way adjustable, which enables you to train your chest muscles (extended arms) and inner chest muscles (90⁰ flexed arms). The leg curl facility can be extended so that either the anterior or posterior thigh muscles can be exercised. The innovative and adjustable double cable pull unit provides a varied training regime for the whole body. It can be used for the upper, middle and lower pull exercises. 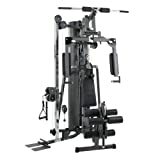 In contrast to many other home multigym’s, the lower cable pull is situated on the side of the machine, this has the benefit of space saving and a better ‘pull’ due to the shorter cable pull.